This website, just as all of the art that I create, is intended to represent different quirks of my personality in hopes of helping me better understand my own identity. With the amount of research I have been doing for my graduate work I have not had much time to create new art to further explore this identity crisis. Rather than not updating at all I am going to attempt to post more art that I have been exploring to see how those artistic creations play a role in defining who I am. When I was in high school my school offered discounted subscriptions to Syracuse Stage. The theater had a season that typically ran for about five or six shows and I had the privilege of going to each show for my last two years of high school. Every few months, always on a Tuesday evening, I would hop onto a bus and arrive at Syracuse Stage for the performance of the night. Syracuse Stage’s selections always ranged in content and style thus I never bothered doing too much research into what I was going to be seeing. The surprise of the show was one of the joys of going. I never knew what I was going to be exposed to and thus could never be disappointed by previously built up expectations after reading a review in the paper. After a few shows, I realized that (just as in cinema) the surprises the theater could expose me to helped me better understand what is required to create a captivating piece of art. One play that I was intentionally ignorant about was the play M. Butterfly which was based on true events. The story follows a French diplomat who has an affair with a Peking Opera singer that he met at a performance of Madama Butterfly. As I watched this situation unfold I was captivated by the interactions these two people had. Each person had their own secretive quirk and I had no idea what to make of the experience. Up until that point I had believed that I was watching an interaction between a French Man and a Chinese woman when really I had been as blinded as the protagonist. The French man had allowed himself to become so blinded by his own fantasies that he believed, for years, that the relationship he was having was with a female rather than a male performing as a female. Without giving too much of the plot away I can confidently tell you that the unique experience of seeing that play unaware of what I had manage to get myself into altered my perception of art making and allowed me to further question my own existence. Alternative perspectives, like the ones within M. Butterfly, can help you expand your knowledge in other facets than geography and basic culture. Though the play takes place in both France and China, the knowledge that can be attained from is not isolated to those two countries. 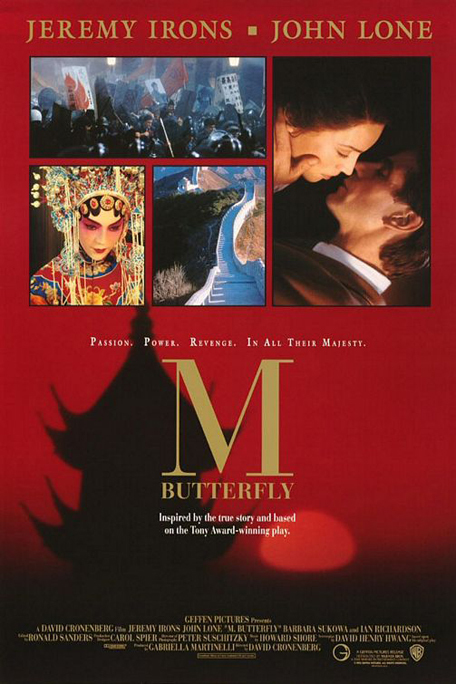 Tonight I took the time to watch David Cronenberg’s take on M. Butterfly which was made in 1993 starring Jeremy Irons and John Lone. Cronenberg’s interpretation, though very similar to the play as they are both written by the same person, takes a different interpretation in regard to advertising that the female figure is actually a male actor. Within the theater it can be a lot easier to withhold information from the viewer. A director’s choice to whether or not to develop programs for the show (where all the vital information is held) will not stifle ticket sales. Within major cinematic productions a director must anticipate having the names of his/her actors/actresses plastered all over movie posters, newspapers, television commercials, billboards, internet side bars, and so on. With this knowledge Cronenberg advertised that John Lone would be playing the role of the Butterfly (the man acting as a woman) arguing that it would reinforce the self deception the protagonist is putting himself through as everyone (including the audience) is aware that he is involved with a man. As the audience sees how blinded the French diplomat is by his own fantasies it is inherent that the viewers starts to question their own lives. If you’re interested in seeing a film that will help add further confusion to your own life I highly suggest watching the play or seeing the film. Both are capable of forcibly shifting your brain in a new unforeseen direction and act as very strange educational tools. Tonight, as I re-exposed myself to M. Butterfly, I started to question my own dreams, aspirations, identity, and the value that specific relationships play in my life, not to mention I started to crave another Shirley Temple.